UFO challengers did so well finishing their favorite UFOs in January! The year is off to a great start, with 19 finishes. And now, on to the parade! I’m so excited to participate in your UFO challenge this year. I made a list at the beginning of the year, and I had 28 UFOs. Yikes! But I finished one today (to Flimsy stage). 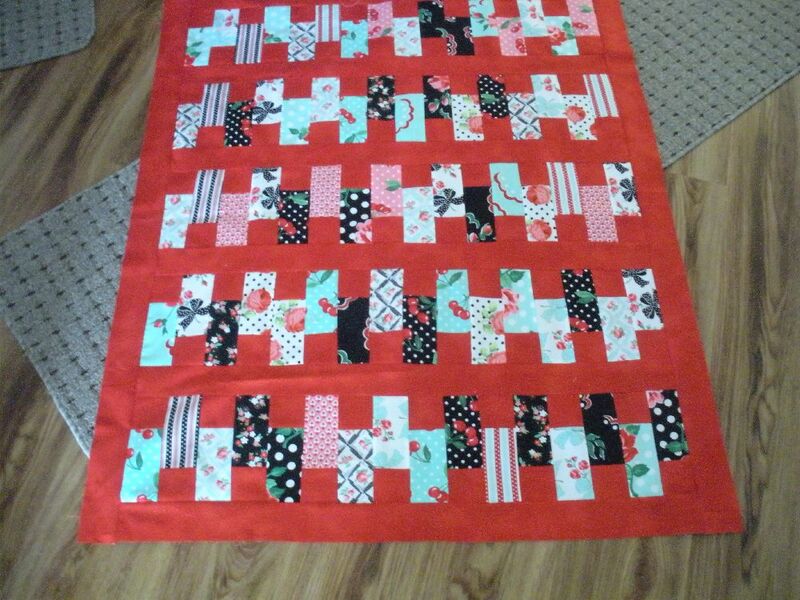 It will be a quilt for my new niece, born just before Christmas. 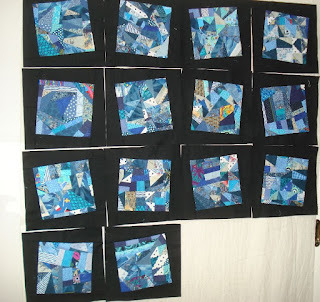 I blogged about it today at My Patchwork Life. Welcome to the challenge, Erin, and I hope you get those UFOs pared down to a reasonable number this year! 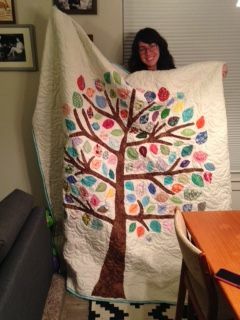 My daughter made a quilt of over 100 leaves and a tree trunk she designed for a woman in her on-line mommy's group. The woman's one year old had died and the group wanted to do something for her. Most sent in signed leaves and Shannon appliquéd them. I quilted it and the woman loved it! 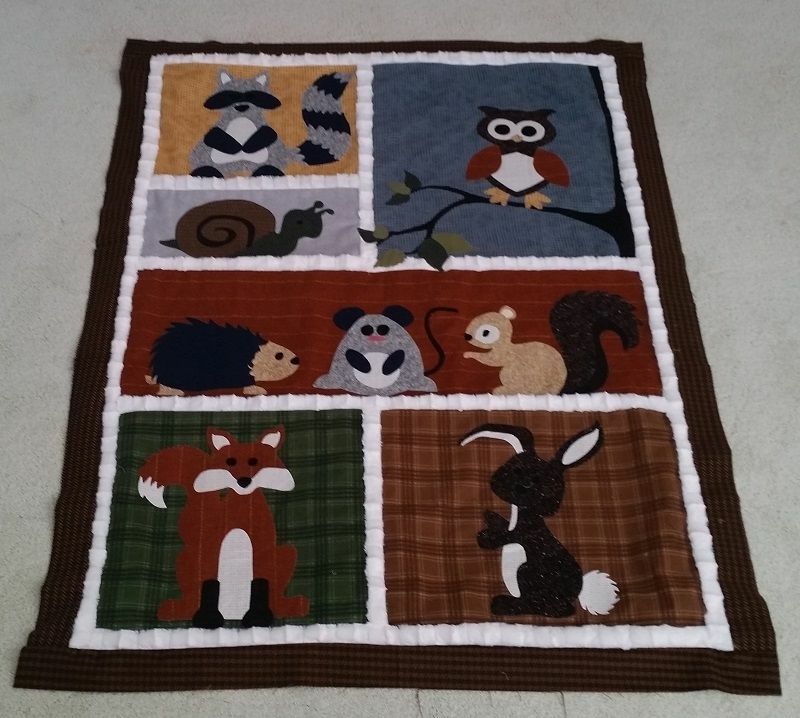 There is nothing like a quilt for comfort! 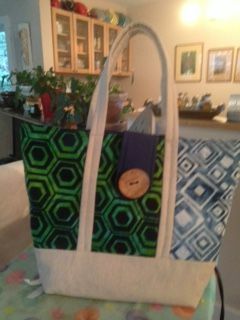 The Boise Modern Quilt Guild had a "tote exchange," and here is the tote Martha made. What a great idea for a swap! Here are some more bags from the swap. 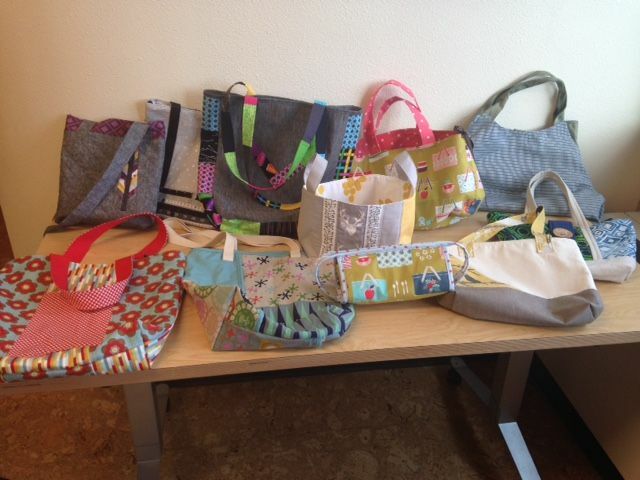 I spy a "Sew Everything" bag there! 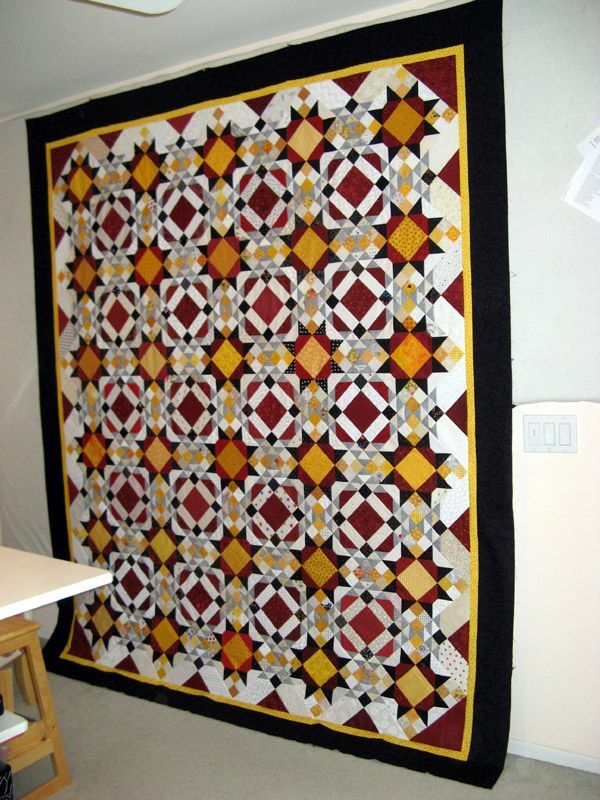 This pattern is from Quilt Expressions in Boise, and is called "Last Dance." I'll be shopping for this pattern next time I'm in Idaho! 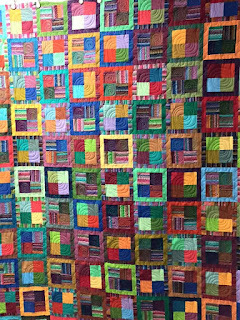 Martha's DH calls this quilt her "circus quilt," but she says the real name is "Fair and Square." Love these colors! You're right, Martha -- it's been a busy month in your household! Whew! It is finally finished! 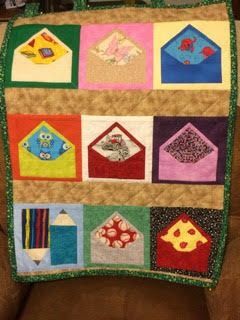 I went back and checked...my very first submission of a UFO was a t-shirt quilt for a friend in January 2014. When she gave me that quilt to reconstruct, she also gave me this quilt to repair. 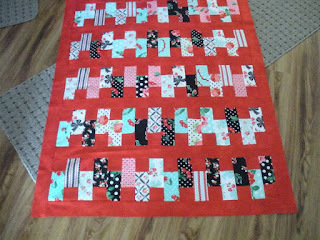 It needed many new diamonds, repairs to seams, a new border, new batting, and a new back. We would have just made a new quilt, but this was sentimental to her, and she wanted it repaired. When I unquilted it, I found more repairs were needed than I originally thought. At that point, the task seemed impossible, and I set it aside to work on other projects. And I kept putting it off...for two more years. I finally decided to just get it finished. I spent my days of being snowed in to complete it. She was glad to have it back. Now I'm spending more time in my sewing room because I can sew whatever I want...Guilt Free! Thanks so much for the "free" month! I think it was just the motivation I needed to prioritize what really needed to be done. Sue's "favorite UFO" is not a quilt but a group of blocks. She says she doesn't want to sew them together until she has them made in all the colors. 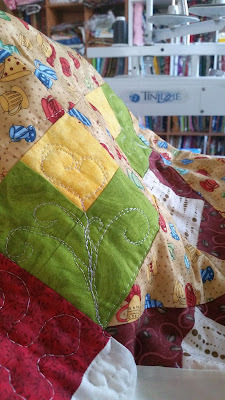 This may result in multiple quilts! 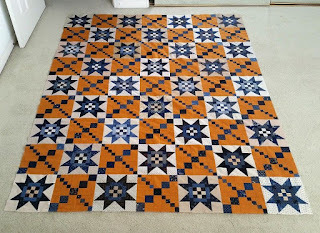 Read all about it on her blog, Quilty Bits and Bobs, here. 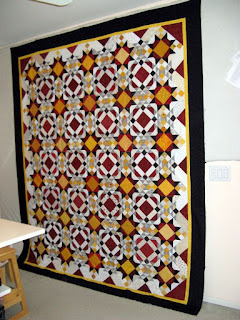 Oh, look, here's another one from Martha and Quilt Expressions! 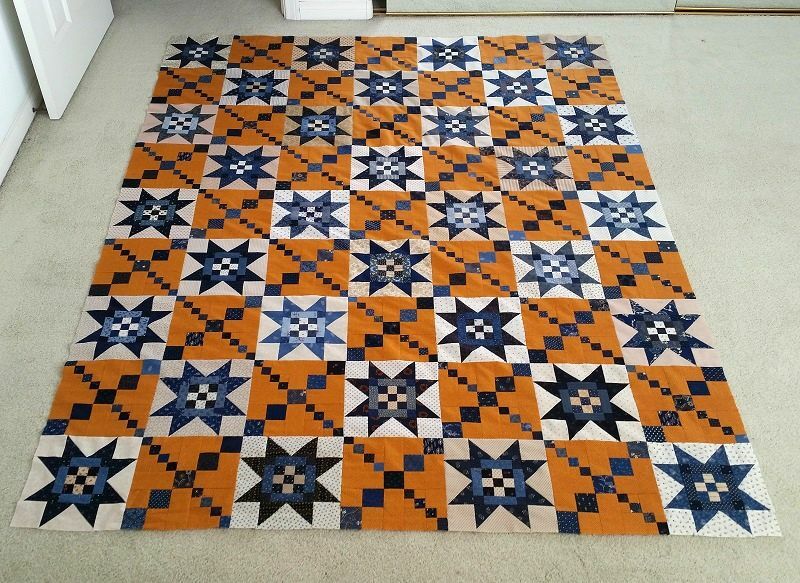 Martha made this quilt from a set of 10" squares. No waste with this clever pattern! 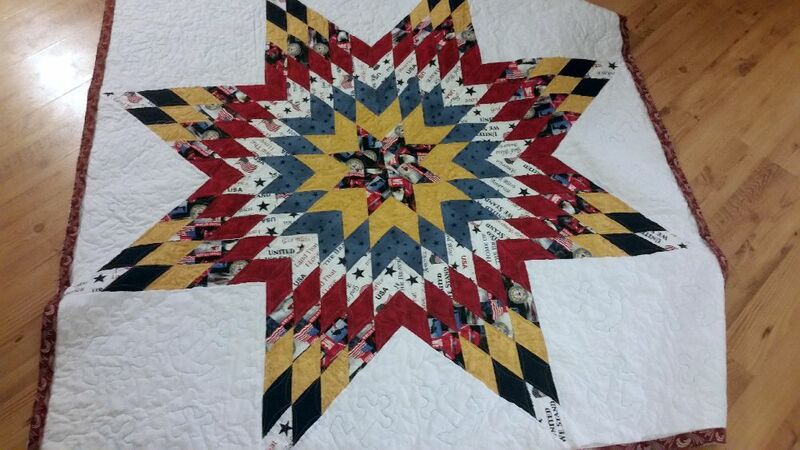 Deb's submission this month is the "Zipper Quilt" from Missouri Star Quilt Company. 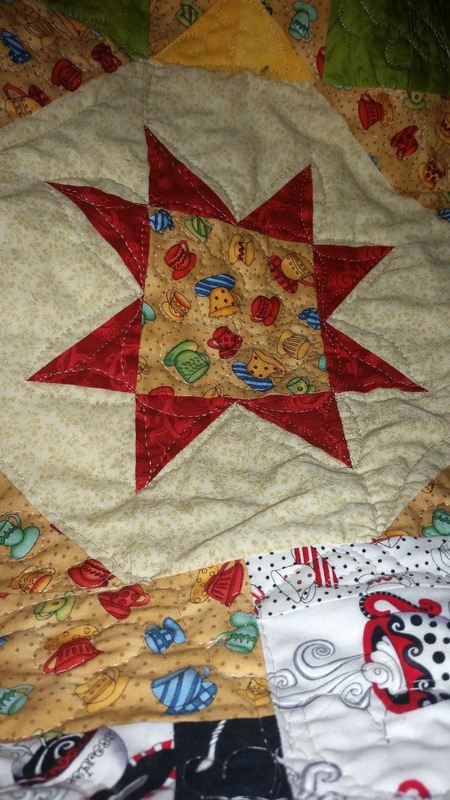 She says a sewing buddy taught her friends to make this quilt, and Debra just had to make her's in red. So cheery, Deb, your photo really brightens my grey, snowy day! 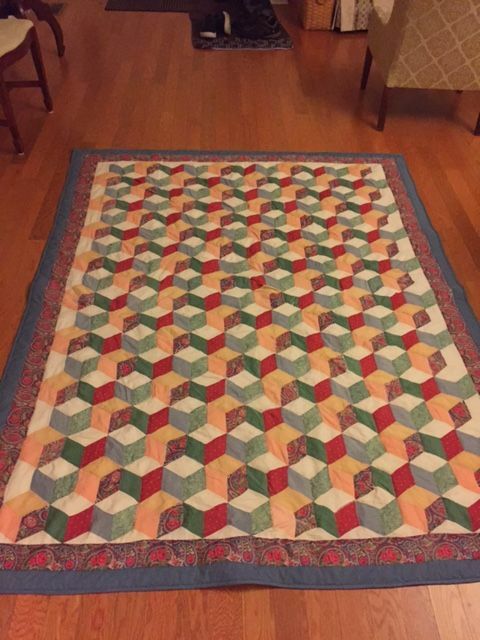 Betsy received a Kaffe Fassett kit from a fellow quilter, and made this beauty for her brother. Lucky guy! 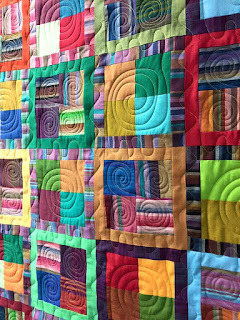 She practiced her long-arm quilting -- here's a closeup -- and I think she did a great job! It was meant to be a finish in my first (?) year of your challenge but couldn’t find it when the time came - so had to do another project. Finally, it's a cushion! And a lovely cushion, too, Susan. Thanks for the chuckle! Ohmigosh, that Martha! 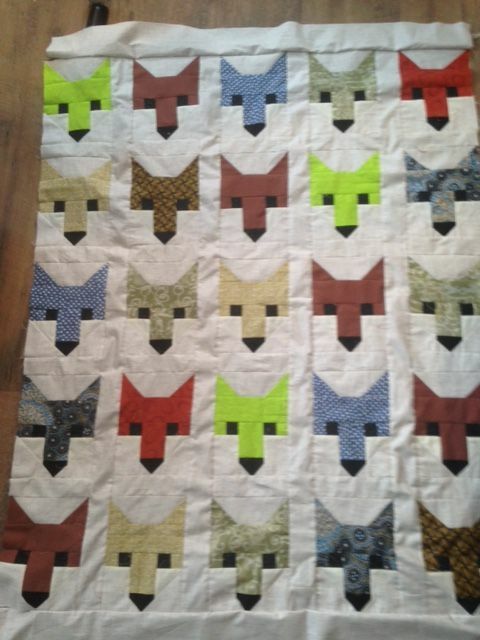 Here is her 5th finish for the month, a cute baby quilt called Fancy Foxes. Kerry has two lovely finishes for January. 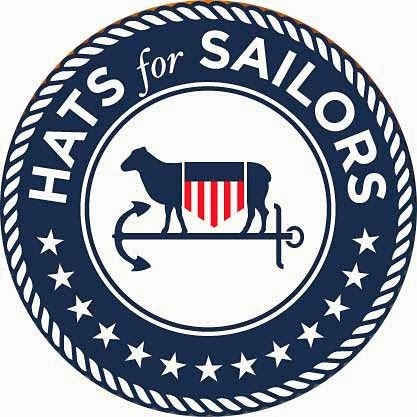 The first is in one of my favorite color combinations, blue and cheddar. 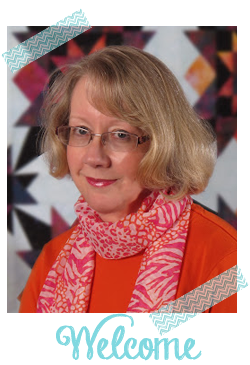 It's called "Survivor," and Kerry started it in a class with Joyce Weeks at the San Diego quilt show two years ago. She says the class sample was pink and blue, but Kerry and I both love the cheddar and blue combination. Next is Woodland Wildlife and is a leftover UFO from 2015. It is for Kerry's Granddaughter. So cute, Kerry, she will love this! Another new UFO challenger, Jennifer, is off to a good start for the new year. She sent in photos of two finishes for this month. 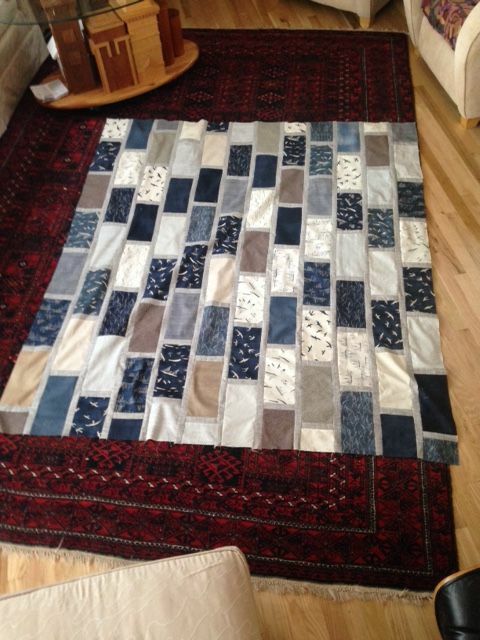 First, Jennifer's "coffee quilt." she says she started it in 2004 or so with swap blocks. More blocks were added in 2009 or 2001, and now it's a lovely finish! The second one is one for my mom. She was diagnosed with Stage 4 liver cancer in September, and we were told to brace ourselves for the new year. 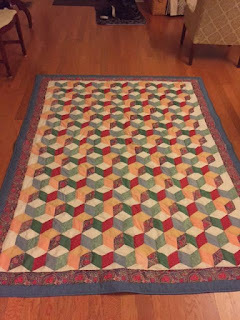 I've had the top done for a a year or so, but never quilted it because I was afraid. It's done now. I just finished the binding. 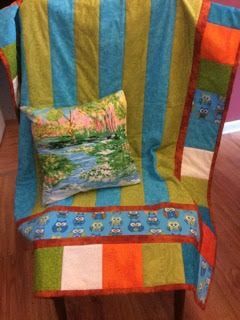 Irene finished two quilts for others this month. The first is lap quilt for a friend battling ovarian cancer. 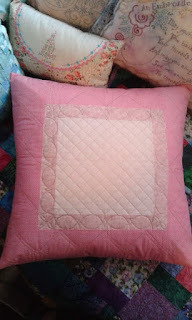 The pillow shows the backing that she used. 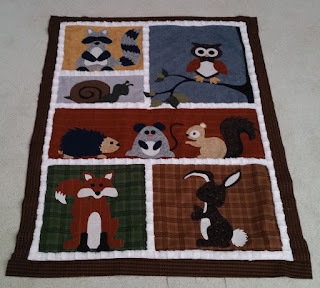 Irene's second quilt is so clever! The second one is from an old pattern book I have had in my UFOs for over a year. It will be in a silent auction fund raiser for our church’s Child Development Center next month. It is a wall hanging organizer for papers, pencils and notes, etc. Each Black Friday now for six years I've been looking forward to Part 1 of Bonnie Hunter's Winter Mystery. Bonnie is so gracious every year with all her followers providing a FREE design. For me she's never disappointed in the reveal that takes place right at the New Year. This year, as she has done previously, is a design in the colors of one of the many trips she takes while lecturing and presenting workshops. The 2015 Mystery was Allietare created to commemorate her visit to Tuscany. I coined my project Kontentment inspired by the meaning of Allietare...to GLADDEN, to REJOICE, to become CHEERFUL. I love the colors of gold, red, black, a constant gray and the very necessary neutrals. So without further ado here is my Kontentment. http://kwiltnkats.blogspot.com/2016/01/sunday-stash-report-january-10-2016.html under the heading LABELS on the right side bar select Kontentment to get every post from the first part. You make me wish I had done this mystery, Sandi! My #9 UFO is the Downton Abbey mystery from year-before-last. What's yours? Mine is a table runner from a quilt retreat 2 years ago this spring. It was a group project for retreat. 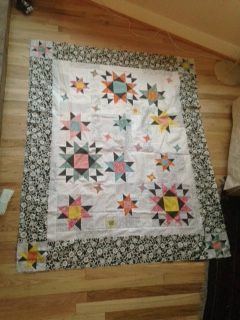 I have it all pieced and just need to finish up the quilting and bind it. Thanks Marti. A wonderful start to the 2016 parade! So many nice finishes! I took you at your word and gave myself January off, though I did finish a top. Can't send a picture because we are traveling. Will have one for February, though! A terrific start for everyone...you go Martha! My #9 project is a small quilt with a machine applique of a princess on it. 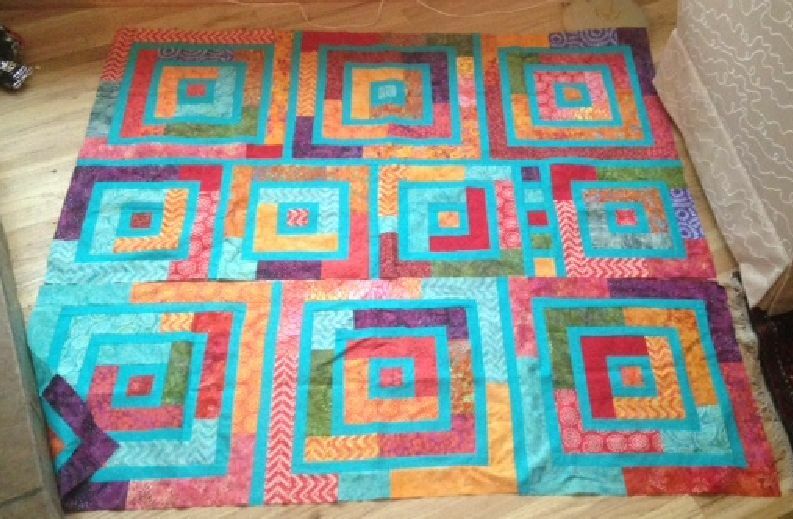 The top is done, it just needs to be quilted and bound. 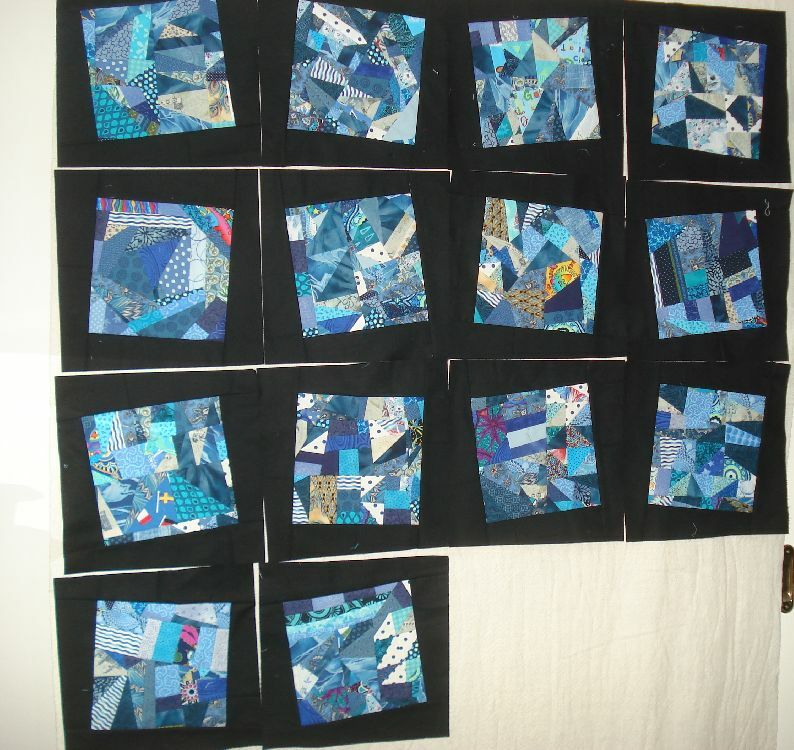 I have a whole bunch of quilt tops that need quilting and binding. Goal for February is to get at least 3 done. What a wonderful group of finishes. Martha is going for doing all her UFO's in six months I think! Well done everyone! My No 9 project is actually two - finally getting around to making a laptop bag and a sewing machine cover. The numbers of my ufos is embarrassing! I cannot even uncover all of them right now because of what is on top of them. But this is my year "of the finishes". No new fabric until I clear two shelf units! Love the support here! 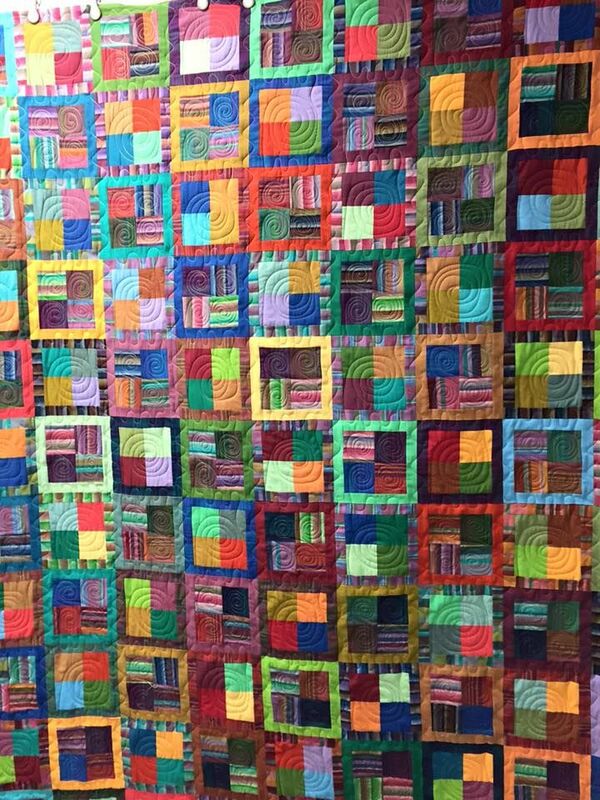 My #9 is a color name quilt made from 1.5" squares. I sure do have my work cut out for me during this short month! I'm hoping for another snowstorm to force me to stay and home and make significant progress! Sunday Stash: My Newest Squee!